But this one I can make at home, right now when the peaches are in season. Clean your grill. Get it hot. Wash your fruit. Halve, then pit the peaches. Stem the tomatoes, then cut in half horizontally. Lightly oil the cut sides of everything, then place it all on the grill, cover. 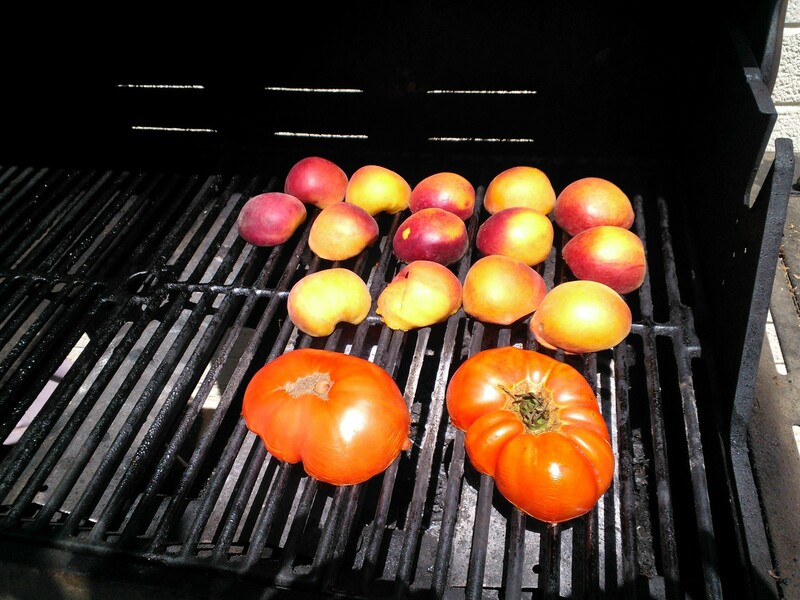 You’re looking for a light char – watch for the peach skins starting to pull away from the edges and the tomato ready to collapse, roughly 8-10 minutes. Pull everything off the grill, set aside until cool enough to handle. Remove the skins from the peaches and tomatoes and put it all into your food processor. Pulse for a few minutes. You’re looking for a sort of creamy texture – not too smooth, but no big chunks. Put the puree into a stockpot, then add everything else. On medium heat, cook until it reaches a bubbling boil. 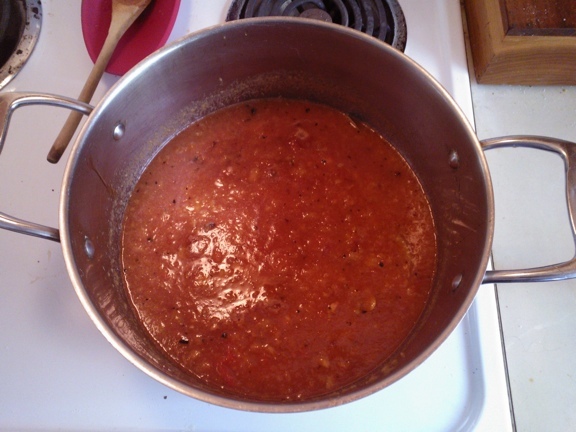 Reduce it to a simmer, and let it cook for about an hour, stirring now and then. The volume will reduce and the mixture will thicken. Adjust with sugar to taste. Run it through a strainer to remove the bay leaves and whole cloves, then into a container of some sort and chill. You’ll want to keep this in plain sight as you’ll be tempted to use it with just about any food you can think of…even burgers. 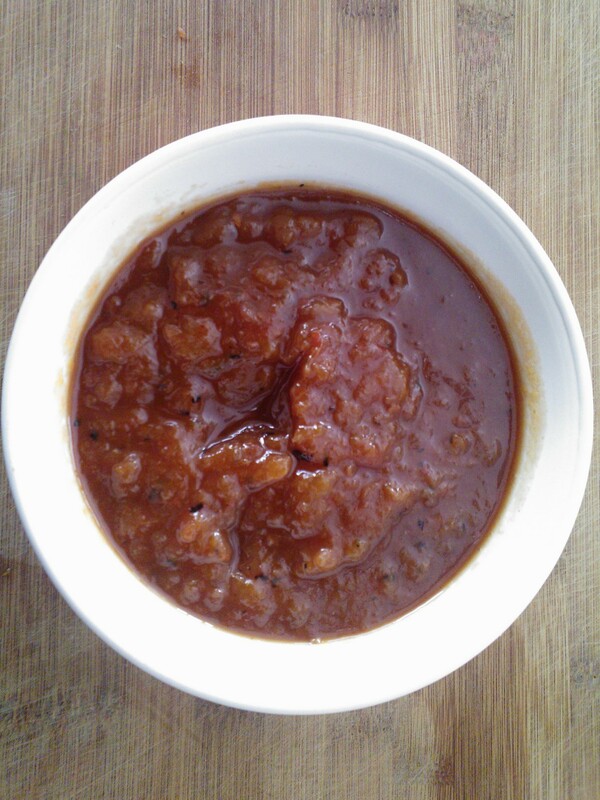 * I substituted coconut sweetener for agave syrup…it added a nice deep note to the final product. Kent McDonald is a certified personal chef, specializing in meals for diabetics, living and working in Phoenix, AZ. (c) All rights reserved, 2016. This looks really good. I want to try it when I get back to Oregon and it’s peach season.